We Are Stronger Than Ruby – . One good trait Filipinos have is that we always manage to smile in spite of the calamity or tragedy we experience. Our kababayans from the Visayas have been through a huge challenge last year as Typhoon Yolanda devastated their land. People lost their properties, houses were ruined, and loved ones were taken from them. Amidst all these, they managed to stay strong and fight and continue with their lives. But just as they were recovering, here comes another typhoon to destroy everything they have built after the monster scratched out everything they already had. But yes, we are stronger than any typhoon. As long as we stick together and get through all of this hand by hand, we will survive this challenge that God has planned to test us. 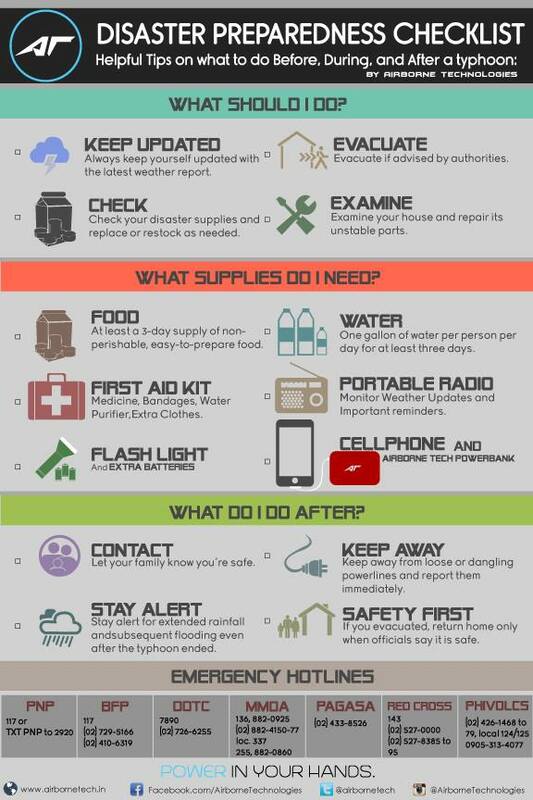 Hope this basic checklist of what to prepare during typhoons will be of a little help. Grabbed it from Airborne Technologies. Let us not forget to pray and ask for God’s guidance to lead us through these dark times. With His grace, this too shall pass.